These are just a few of the things the average fly angler will festoon themselves with while out enjoying a day on the water. In order to avoid rolling around a humongous gear ball with our legs, like a dung beetle only on a much larger scale, fishermen often tend to economize in the camera department. Telephoto lenses taking up the same amount of space as a foot-long hoagie sandwich tend to get left at home. I usually subscribe to this less-is-more approach myself. The telephoto lens (generally defined as a focal length greater than 100mm) does have a number of distinct advantages for fishing imagery. Why sacrifice your 12" Meatball Marinara in favor of a tele? Backing away from the subject and shooting at longer focal lengths has some advantages. The key is to understand and visualize the types of images you hope to capture in advance, making it easier to pick the right tool for the job. Isolation draws attention to the main subject of a photograph, which can be accomplished by rendering backgrounds that are smooth, soft, and not distracting to the viewer. One easy method to accomplish this is to simply back off, and shoot at 200mm or 300mm. Leave some distance between the subject and the background, and the result is great bokeh. 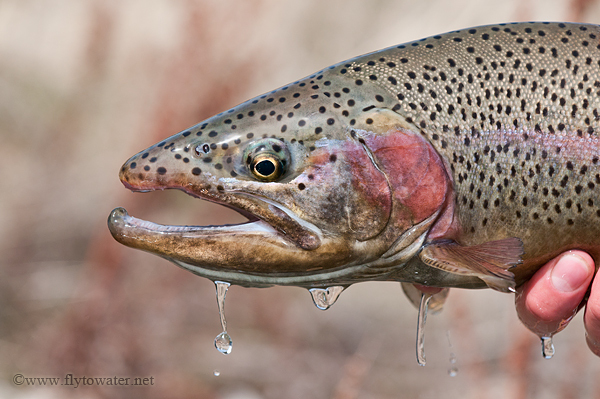 This example was taken at f/5.6 and 200mm, allowing the trout and the water droplets to be the obvious center of attention. Just because you can get close, doesn't always mean you should. Go long for this type of result. Sanders - thanks for the comment! I'm glad it was helpful. Stay tuned for a couple more installments in the next week or so. Cool blog by the way. I use a canon sx30 and for the money it does a pretty good job but I sure have to work with the auto focus at times as the manual push button is crapy compared to the control of a real 400mm lens. Thanks Russ. I have heard good things about the SX30, although you're right about manual focus override being a handy feature.